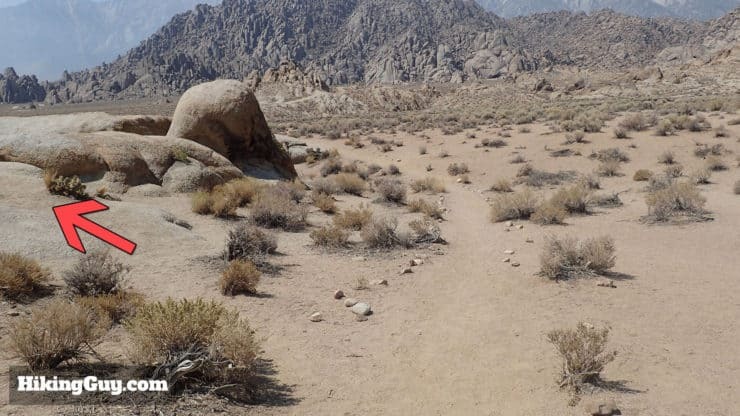 The trailhead address is: Mobius Arch Loop Trailhead, Lone Pine, CA, 93545, USA. 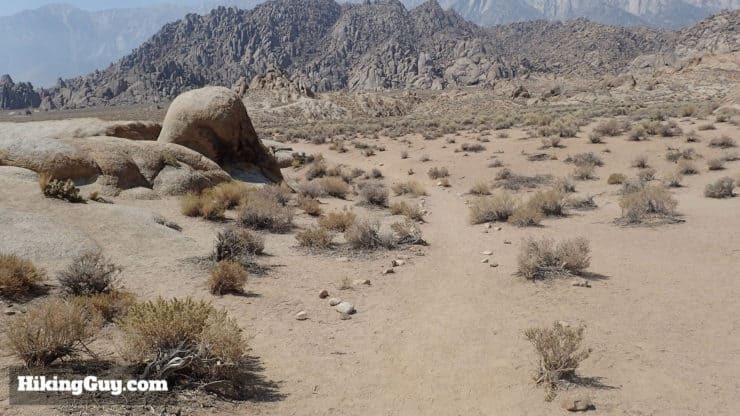 The trailhead is just off Whitney Portal Road between Lone Pine, CA and the Mt Whitney trailhead. 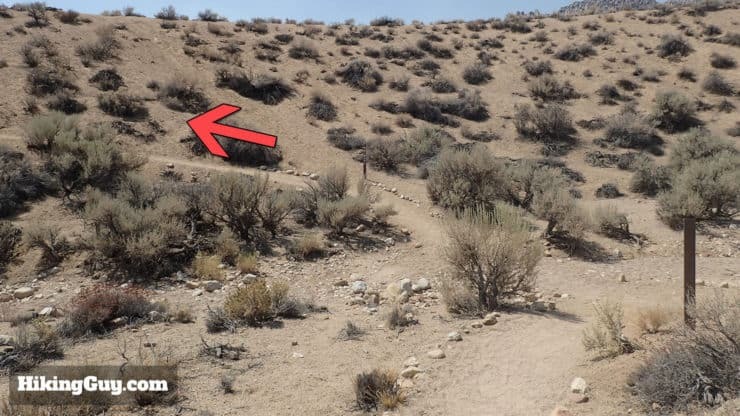 Once you’re on Movie Road, the directions below will help guide you to the trailhead. 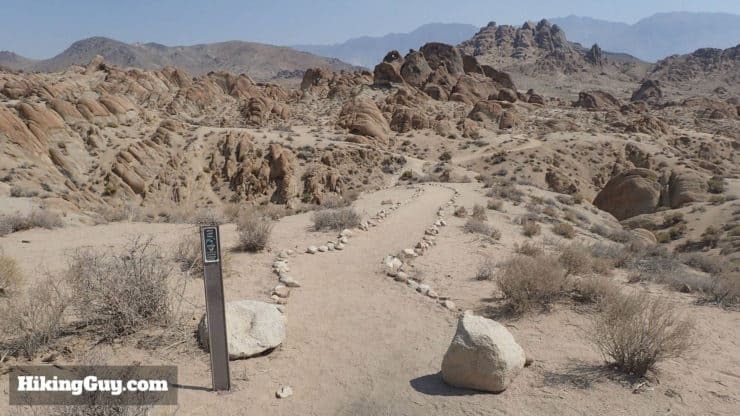 Once you’re on Movie Road you’ll see a sign for Alabama Hills Recreation Area. The road is otherwise unmarked. You just stay on the widest dirt road as you go, avoiding side roads. 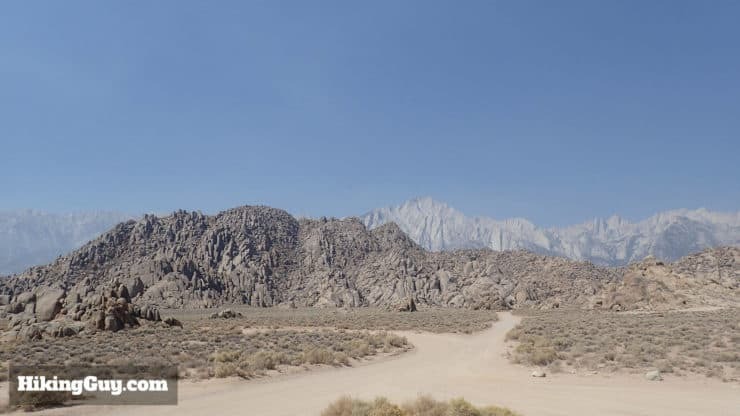 The views of Mt Whitney are to your left as you head to the Mobius Arch trailhead. Also, note the smaller side roads and trails that you avoid. Eventually Movie Road splits, head right and the parking lot is right after this. 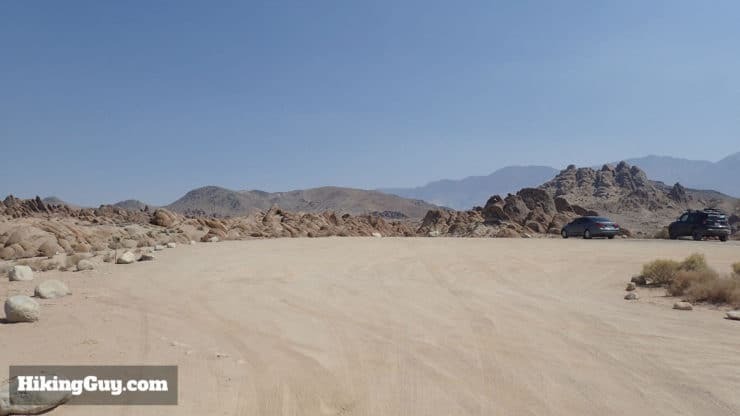 The Mobius Arch Loop Trail parking area is massive. 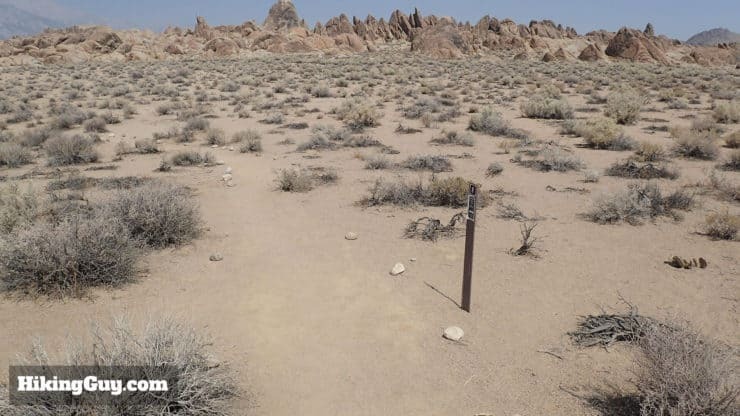 Also note that if you are looking for a place to camp, this is Bureau of Land Management (BLM) land and free game for camping or car camping. 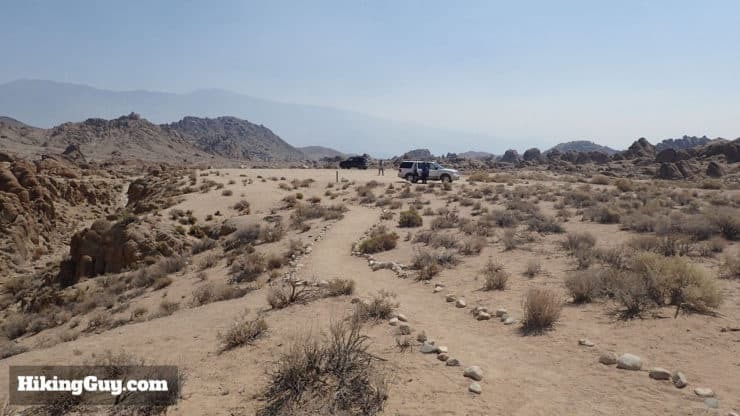 There are not facilities and it gets hot, but there are plenty of nice places to setup for the night. 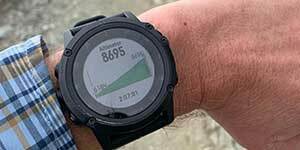 It can come in handy if you want to grab some sleep before attempting Mt Whitney. 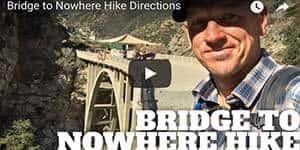 This is a short, easy hike that you don’t need any special gear for. It does get incredibly hot here, especially in the summer, so water is important. 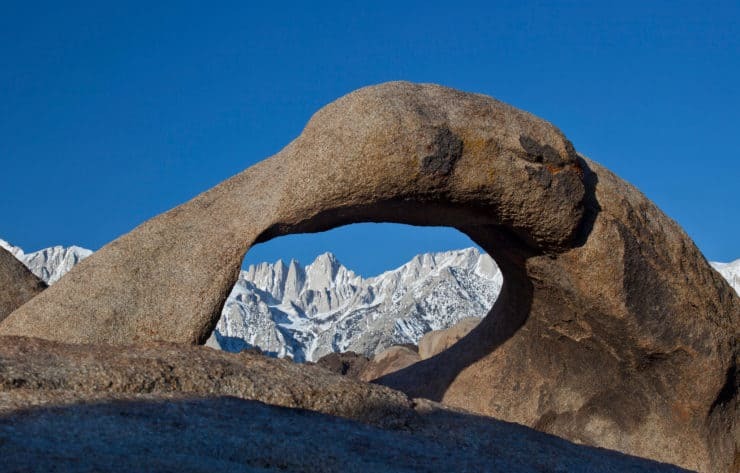 Here’s a great shot of Mt Whitney through Mobius Arch. 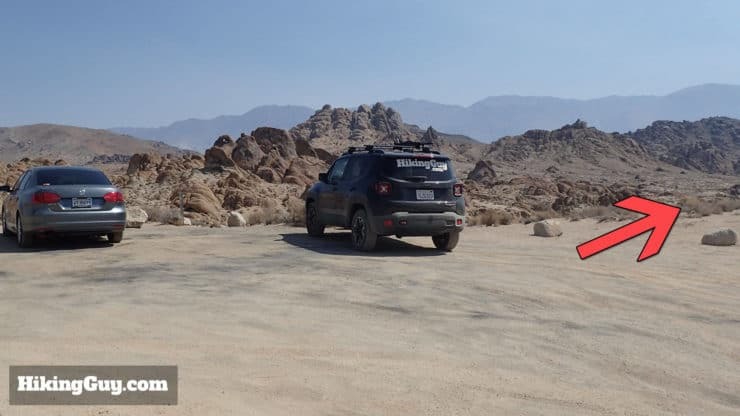 Photo from BLM. 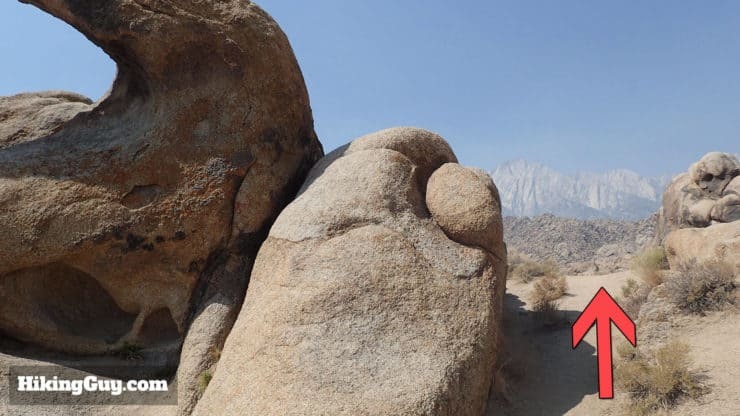 Mobius Arch Loop Trail is in Alabama Hills Recreation Area, home to a bunch of beautiful geological formations. 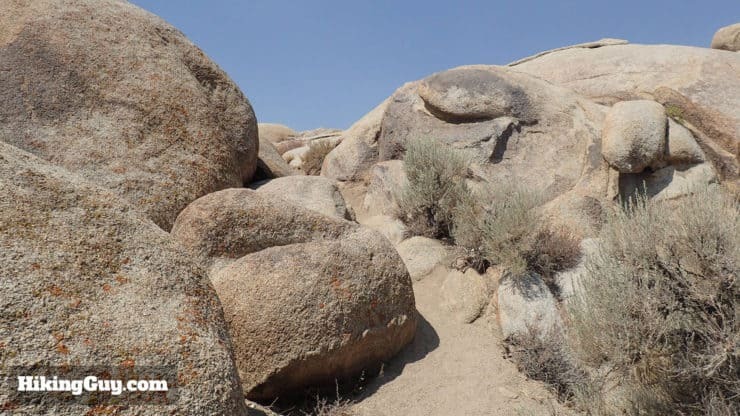 The rocks you see here are the same age as the high mountains of the Eastern Sierra, but they’ve just eroded differently. Most of the rock you see is between 82-200 million years old. Miners who sympathized with the confederate cause named this area after the CSS Alabama battleship, a confederate ship that wreaked havoc on Union shipping. Mobius Arch got it’s name because the one side looks like it folds over, like a Mobius strip. 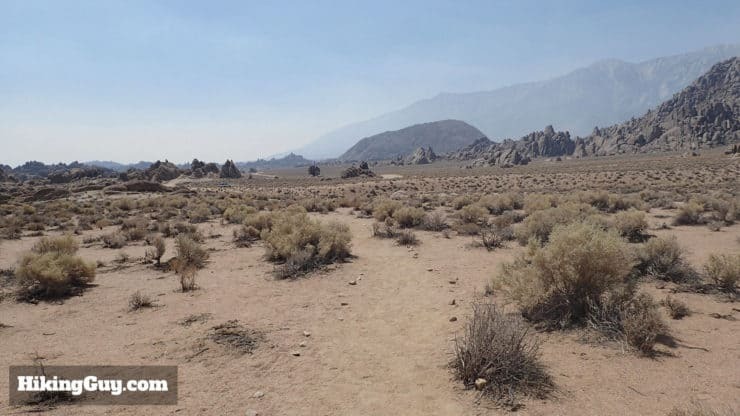 Alabama Hills Recreation Area is the setting for a ton of movies and TV shows like the Lone Ranger. 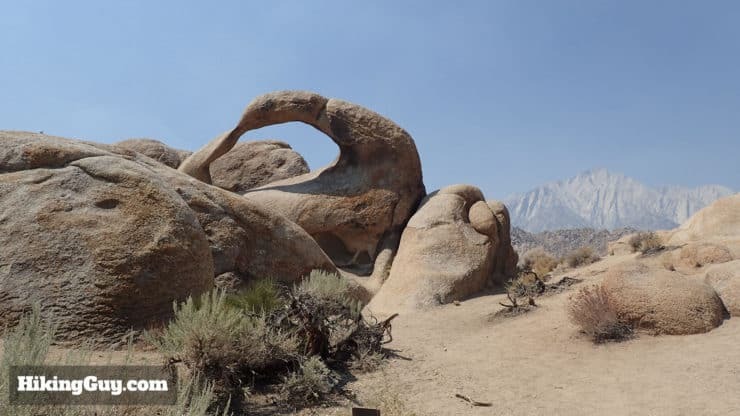 There’s a movie museum in Lone Pine and they offer a self-guided tour of Alabama Hills Recreation Area, but most of the films are older westerns. If you’re not an old movie buff, you might not get much out of it. They did film parts of Iron Man, Django Unchained, and Gladiator here though. 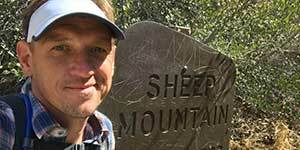 The hike has two great arches that you can frame Mt Whitney and the Sierras in, Mobius Arch and Lathe Arch. 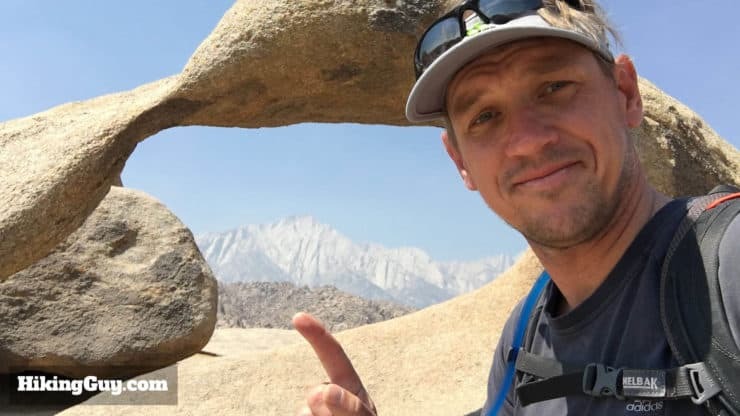 The image in the picture in this article is Lone Pine Peak, which is a little more photogenic. 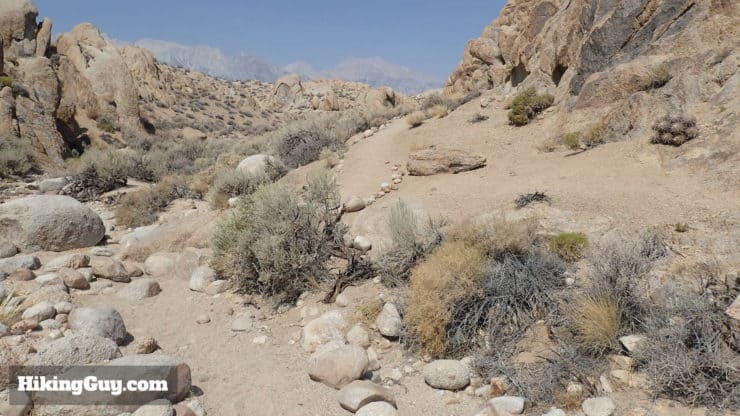 This is a quick hike that you can do while staying in Lone Pine or Whitney Portal. I usually do it after dinner to catch a great sunset on the rocks. Sunrise and sunset will get you great colors on the rock. 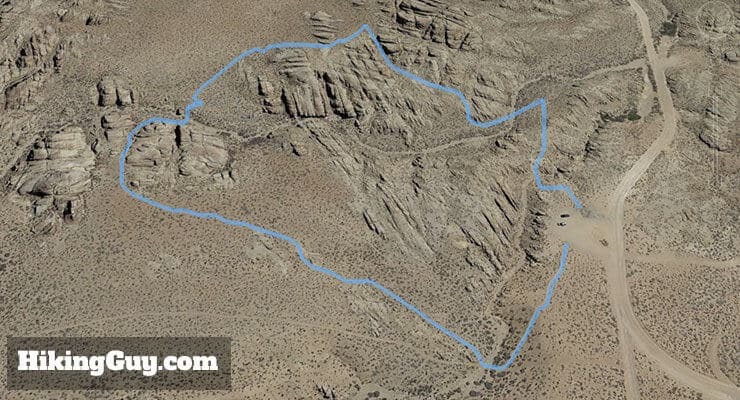 The Mobius Arch Loop Trail does a simple circle, starting and ending in the well marked parking lot. Start the hike on the trailhead at the right end of the parking lot. The loop trail entrance is well marked. 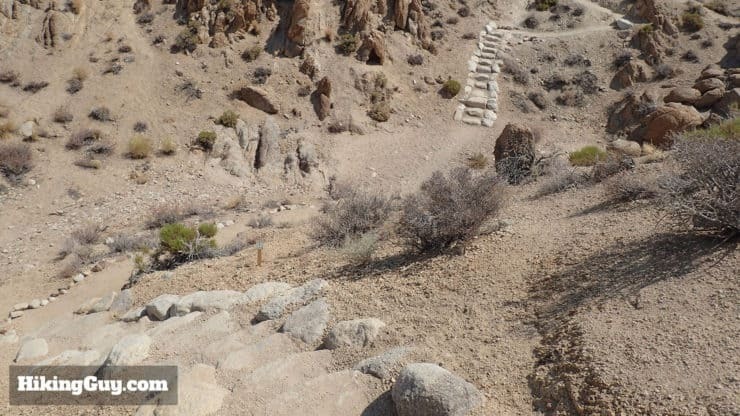 At the start you head down these cool stone stairs and then back up the other side. Keep your eyes open for lizards. 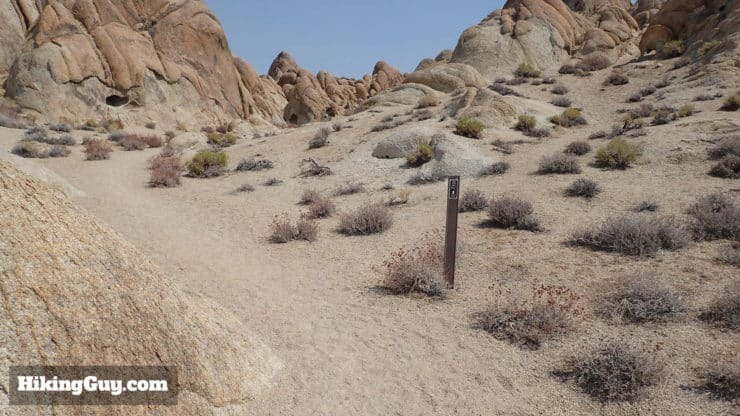 Once you hike up the little hill, the trail is well marked with stones on either side. 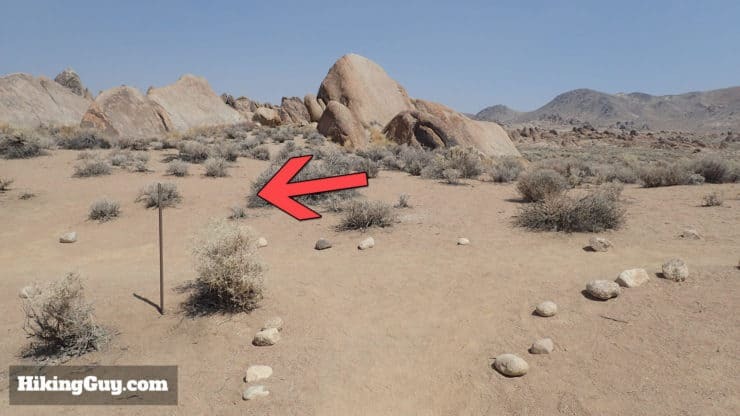 When the stones are not along the trail, there’s usually a brown trail marker to show you the way. 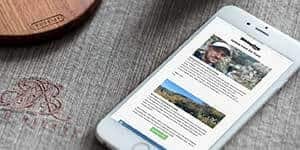 Because this hike is short and easily accessible, you get lots of people who explore off the trail, and sometimes the footprints diverge off the official trail. Just a heads up. 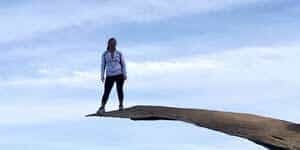 This point of the hike was probably the most confusing. Stay straight toward the brown post. There’s only one major trail junction. 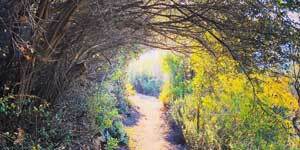 Keep to the left when the trail splits to a T. Hiking right brings you back to Movie Road. 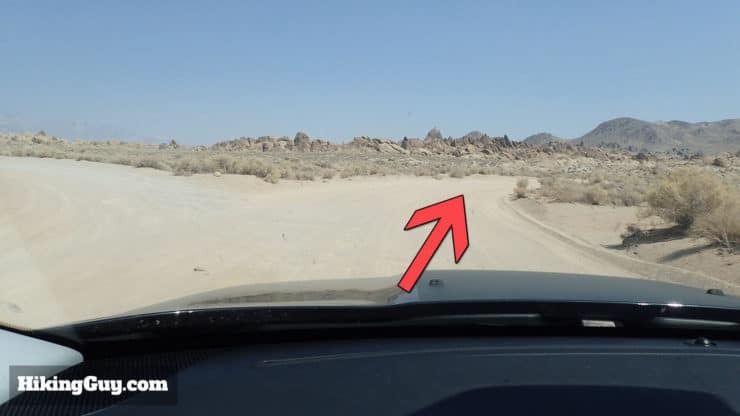 Shortly after the left, a brown marker lets you know that you’re going the right way. After a flat stretch the trail starts to get rocky again. Climb up onto the big section of exposed rock. Here you are, Mobius Arch! Climb around the rocks, take your pictures, and have fun. 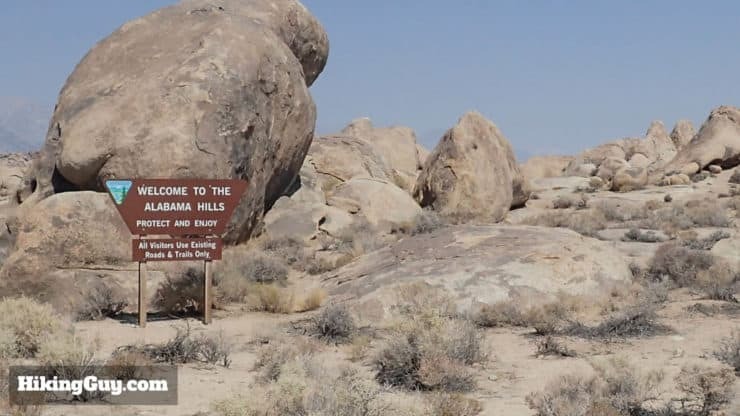 When you’re done exploring Mobius Arch, head back to the right of the arch to continue. Lathe Arch is much tricker to get to. 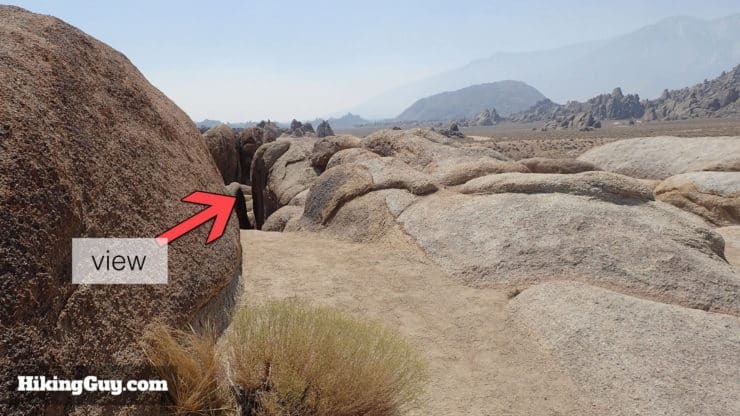 As soon as you walk over the exposed rock at Mobius Arch, make the first left on a smaller trail. There are footprints that help out. 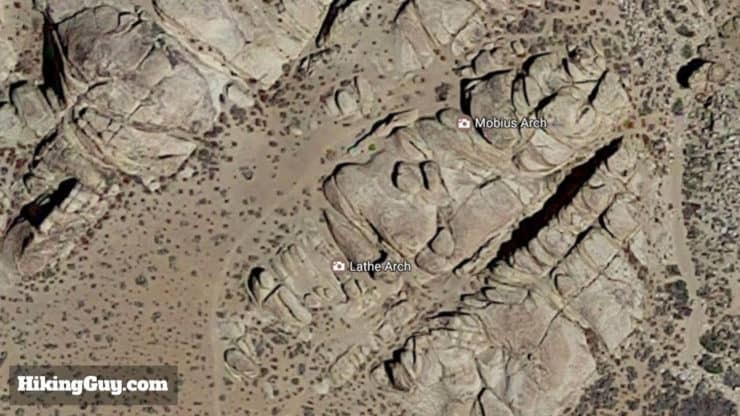 This satellite photo gives you an idea of where Lathe Arch is in relation to Mobius Arch. 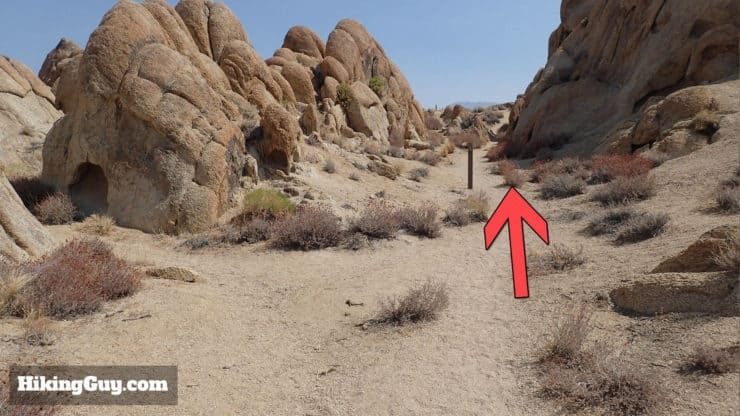 You have to head into this area to see Lathe Arch. You can’t see from the main trail like Mobius Arch. 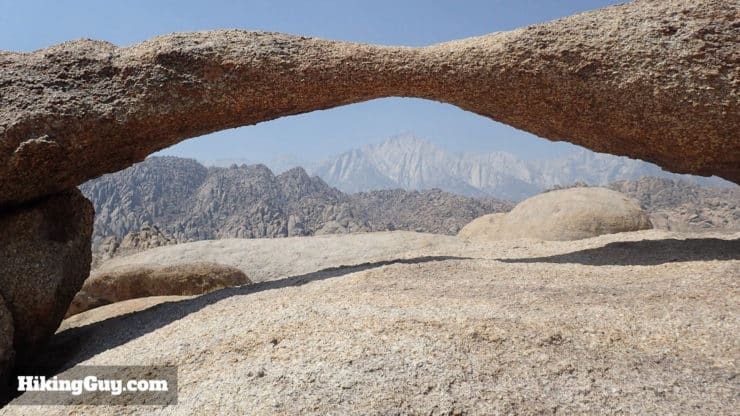 Here’s the view of Mt Whitney through Lathe Arch. 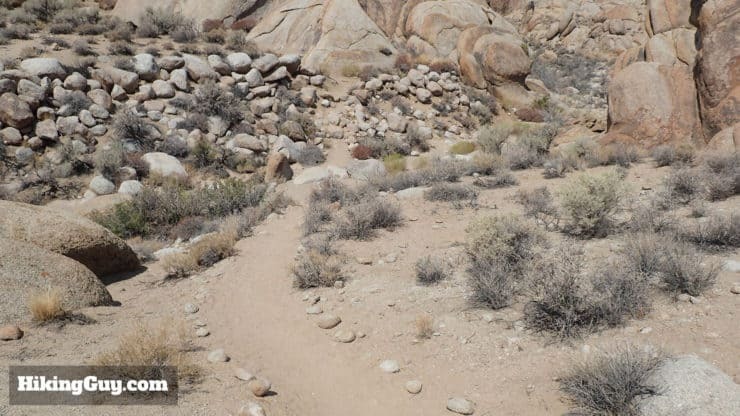 After you check out Lathe Arch, head back to the main trail and continue straight, as if you just left Mobius Arch. The trail is easy to follow as it heads back to the parking area. At the bottom of the hill, take the trail up to the left and climb up to the parking lot. And here you are, back where you started, but on the other side of the lot. Happy trails!